The video I just posted doesn’t show all the slides. In practice, there isn’t a Powerpoint deck that I can post, because many of the slides are hand-drawn by me during the talk. So, instead of slides, here’s a summary of the key points. If a nerd like me can do it, I reckon anyone can! The two in the middle, about interests and options, crop up again and again in IT. Present your concerns, explicitly as concerns. (Again, there are many other techniques from sources such as the books mentioned above. The talk covered only a sample). Your are obliged to present your thoughts as fully, clearly and persuasively as you can… and to help others to likewise. Be open to the possibility that you might be persuaded (genuinely believing this takes stress off you, and is fun once you get used to it). It takes about as much effort to learn this stuff as it does to play tennis. … if employees came to your company because it had a great interpersonal culture. Showing the “arrows of communication” in both directions. I enjoyed your video — I think a Powerpoint deck of your hand-drawn slides would be an excellent way to quickly refresh the ideas in your video. Hi James. Glad to hear you enjoyed it. I’ll remember your suggestion about slides. Can’t do it right now because I’m really busy. But now that you’ve pointed it out I can see it would be a good idea for me to do it when I have time. 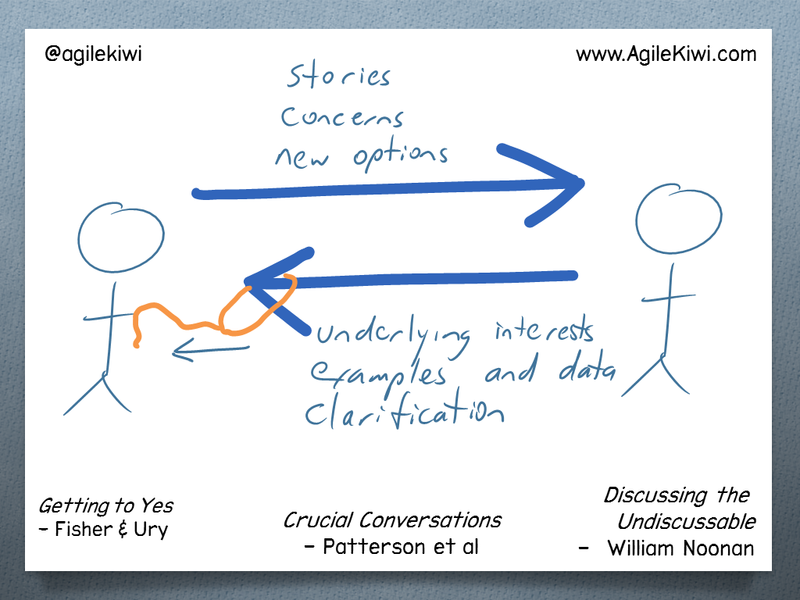 © 2017 AgileKiwi. Theme by XtremelySocial.